Lauren's First and Goal is a non-profit organization, a labor of love started in 2004 by John and Marianne Loose in honor of their daughter, Lauren, a pediatric brain tumor survivor. Since its inception, LFG has raised more than $2 million toward its mission to provide financial support for brain tumor research and cancer services, to offer financial and emotional support to families living with pediatric cancer, and to increase awareness of the disease. Learn more about Lauren's First and Goal. Lauren’s First and Goal Foundation is thrilled to announce that its annual football camp raised more than $125,000 and welcomed nearly 1,800 campers. The one-day event, held Sunday, June 4, and presented by Lafayette College also included more than 300 college coaches and hundreds of others volunteering to run the day. 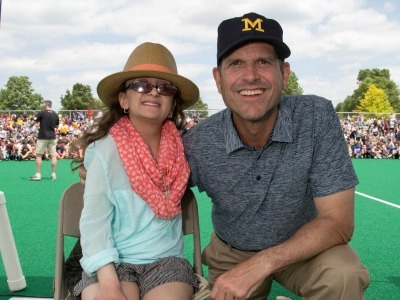 Lauren’s First and Goal Foundation today announced nearly $170,000 in grant awards to pediatric cancer research, patient services, and families impacted by the disease. LFG has now awarded more than $1.6 million in grants as part of the fight against pediatric cancer since 2004. Just 12 years after the idea of Lauren’s First and Goal Foundation was conceived, the nonprofit organization announced it has surpassed more than $2 million raised. Its 2016 high school football camps at Lafayette College and Otterbein University, held June 4-5, helped LFG reach the milestone. It's now easy to donate online. Each year, Lauren's Circle of Strength grows making it stronger and better. Learn about our volunteer opportunities. All proceeds are directed to Lauren´s First and Goal Foundation. Sign up to receive our email newsletter and stay informed about LFG news and events. Registration for 2019 is OPEN! Registration for the 2019 Lafayette College presents Lauren's First and Goal football camp on Sunday, 6/2/19 is now open. You may register online or by mailing in a paper form. Please click on the football camp tab above to read all the important information regarding the camp and view the registration materials, links and downloads. Click on the Ebay Giving Works icon to see our auction listings. More than 130 volunteer college and professional football coaches contributed skills and drills for this book to support Lauren's First and Goal Foundation. Order your copy today. 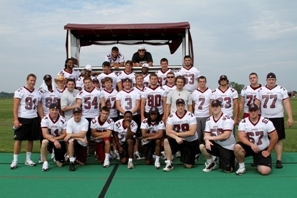 Pictured above: Lafayette football player volunteers. We'd like to take a moment to thank all of the campers, coaches and volunteers who help make our annual Lauren's First and Goal football camps a great success! A way to help families who are battling childhood cancer© 2019 Lauren's First And Goal, All Rights Reserved.